We get it - social media marketing and management takes time. A lot of time. From understanding the different audiences on each platform, and knowing which performance metrics to measure, implementing a social media marketing strategy into your overall marketing approach is tedious. But fear not! Social media marketing is what we do. Read on to find out the answers to some of the most common social media marketing questions we get asked every day. Let’s face it: the world’s gone social. In fact, 30% of all time (and counting) spent online is allocated to social media. If you want to get in front of people, social media is the way to do it. Whether you’re interested in brand awareness, sponsored content, or a combination of both, we can help! What social platforms should I use? The short answer: it depends. While Facebook is a great starting point, we like to get to know each client on an individual basis. Because every brand is unique, deciding which platform(s) to spend time on relies on factors like where your audience is, what products and/or services your business provides and the goals you wish to achieve. On most platforms, it’s best to post at least twice a week, but some social media outlets are an exception. Twitter and Pinterest can be more frequent if your team has the time and the content to post. At Blue Compass, we post on Twitter daily, whether it’s socializing a blog, office event or relevant curated content. Another great way to stay top-of-mind is utilizing Snapchat, Facebook and Instagram Stories. Stories only last 24 hours, so you have the opportunity to create a sense of urgency and exclusivity with your content without being too excessive. How often should I post non-self promotional content? In the world of social media, you get what you give. It’s important to share industry-related content, “real-time” photos and even user-generated content on a regular basis. At the end of the day, social media is a social network. Engaging with other brands and your social audience from a personable perspective shows people you’re more than just a brand - you’re a person just like them. How can I schedule social posts? Creating a batch of social posts and scheduling them ahead of time will save a lot of time in the long run. We use Facebook Business Manager to schedule all posts that are released on our Facebook channel and our clients’ pages. For all things that go out on the Twittersphere, we prefer to use TweetDeck. Instagram posts can be scheduled through HootSuite, which also allows you to schedule posts on a variety of social networks including Facebook, Twitter and LinkedIn. Since not all platforms allow you to schedule photos and videos in advance, we choose to post to LinkedIn, Pinterest, Google+ and YouTube in real time. What tools do you use for social media marketing? In addition to the scheduling tools listed above, our team uses Google Docs to collaboratively write and edit social posts. We also use Adobe Spark and Photoshop to create and size images. Can I delete bad comments or reviews on social media? While your Facebook Business page can’t delete users’ comments, you do have the ability to block specific words and profanity from your page. You can also hide unwanted comments. This can all be managed under your ‘Settings’ tab in the upper right hand corner. As far as Facebook reviews go, you can turn those off too. However, we don’t recommend this option because reviews today are as important as ever. If you do receive a bad comment or review, we believe it’s best to respond with a solution, such as asking the reviewer to contact you directly (through direct messaging, email or phone) to resolve the situation. This lets the public see you are proactive and want to make your customers happy. What's the difference between an ad and a post on social? A post is content you share on social media for your followers to see organically. An ad is a paid post to target an audience outside of your followers based on demographics and interests. Because most social media algorithms limit the number of followers who see your business' content organically, we recommend promoting important or relevant posts to guarantee more people will see them. Another great indicator of a post that should be promoted is one that performs well organically. If it's doing well on it's own, putting money behind it will increase its reach. What are promoted or boosted social posts and how do you do them? Ads are called different names on most social channels, but in the end they are fulfilling the same purpose. On each platform you can set up an advertisement directly from the post to increase engagement, or set up a more advanced ad through the social channel’s advertising platform. A “boosted” post is the most basic advertising you can do on Facebook. They are created by allocating advertising budget to a post already on your business page. 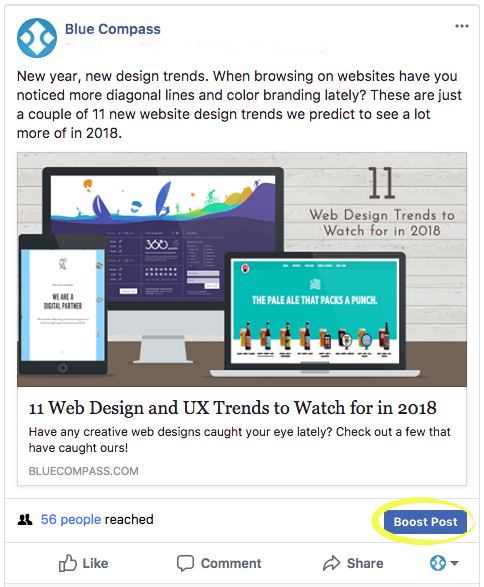 When you choose to “boost” an already existing post, more people will see it in their news feed. Boosted or promoted posts are typically used when the goal is to increase audience engagement such as post likes, shares and comments. If you’re looking for a more customized approach to advertising, Facebook Ads are the way to go. Like most social media platforms, Twitter allows users to promote Tweets directly from a post that's already been sent out. Another easy option to get better engagement for your Twitter account is to use Twitter Promote Mode so each Tweet will automatically be advertised to other users. Our team prefers advertising through Twitter Ads, which offers the most detailed targeting options of all of the social advertising platforms; you can reach people by location, keywords, followers, behaviors, interests and more. Twitter Ads let you promote already-posted tweets, scheduled tweets or create a new Tweet on the spot. To do so all you need to do is visit Twitter Ads Manager. Next, you can set up your daily (or lifetime) budget and targeting criteria - namely, if you want to target by interests, followers or keywords. The difference? Targeting by interest and followers allows you to create a list of Twitter usernames, and then target those users whose interests are similar to the interests of those users’ followers. Targeting by keywords allows you to reach people that search, tweet about, or engage with specific keywords. 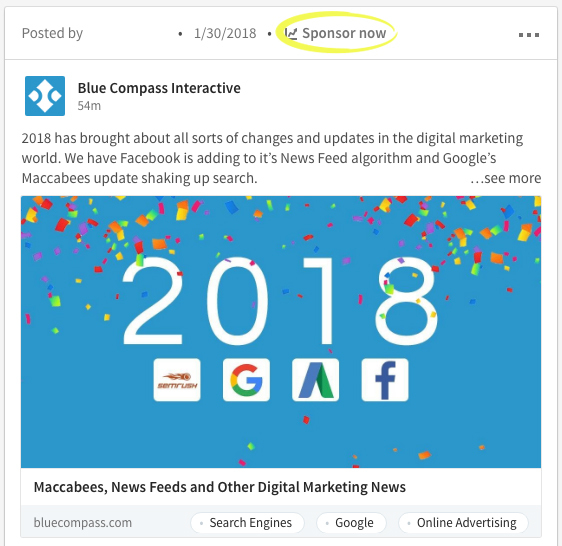 Similar to Facebook, you can advertise on LinkedIn through their specific advertising platform, or simply by sponsoring a post from your page. Their Campaign Manager is a great tool and works best when your goal is to target professionals in a certain area or specific field since LinkedIn offers detailed information about careers. We mostly use LinkedIn advertising to promote our job openings or when we have industry-specific blogs we want other digital marketing professionals to see. A promoted Pin is simply a Pin that you pay to promote so more people will see it. Although Pinterest doesn’t offer as specific targeting options like other social media channels, it’s still important to narrow down your audience as much as you can. You can get to the ads option through the plus icon at the top right-hand corner, or by promoting a pin right after pinning. It’s difficult to put an exact number on what your social media marketing budget should be, but there are some limitations in certain platforms. For example, you need to spend at least $10 each day you advertise on Facebook. We don’t put ad spend behind everything we release on social channels, but when we do, we put at least $25 behind our content. Obviously, more spend will usually get you more results, but a little can go a long way. We recommend starting with a lower budget and testing ads to see what works best for your brand. According to Social Media Today, these are the latest updates on demographics on social media users. Facebook is typically enjoyed by a variety of ages. Users aged 18-49 use it the most, and women typically check Facebook more than men. People usually check Twitter for news, trending topics or to keep up with brands they’re interested in. Young adults ages 18-29 are the engaged Twitter users. Twitter is one of the few social platforms where there are more male users. Instagram is an effective social network for businesses with products or services that can be captured in a compelling photo or video. The main Instagram users are 35 years old or younger, and there are more women on this network than men. Pinterest is similar to Instagram in that it is very visual. Women are more active on Pinterest than men, and this platform has the largest age range with a fairly equal distribution between ages 18-64. Snapchat is great for capturing the attention of a young audience in a short video or Snapchat ad. Snapchat users mostly consist of people in the 18-34 year old age range, but some users are under the age of 18. Do people really use YouTube? Yes! YouTube is increasing in popularity as video becomes the norm. Additionally, it’s the second largest search engine behind Google, so businesses shouldn’t ignore it. YouTube is another platform that catches a wide audience with a user age range of 18-49. Do I need closed captioning on my video? About 85% of videos on Facebook are watched without sound, so adding captions to your video is definitely worth your time. Closed captioning enables people to follow along and watch your content anywhere, anytime. Optimizing your Google My Business (GMB) page will help you stand out from your competition in a local search. It also gives your customers useful information, such as your business name, phone number, location and hours. Here are a few more helpful tips on how to use GMB to improve your ranking in local searches. Is Google+ the same as Google My Business? Google+ and Google My Business are both Google tools, but they are not used interchangeably. GMB is used to keep your company directory information up-to-date. Google+ is similar to other social media platforms where you can share posts to followers. There are some people that really stand by Google+, but most businesses see more value using other mainstream social platforms. At Blue Compass, we use Google+ as another way to provide information to Google for search engine optimization. How can I tell if there’s a Facebook pixel on my website? 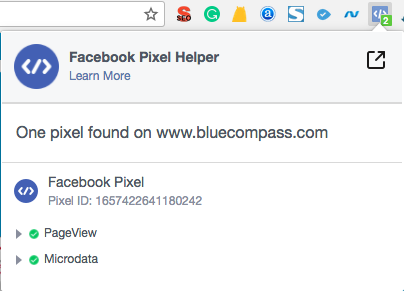 The Facebook Pixel Helper is another Google Chrome plugin that shows you if you have Facebook pixels on your site. The Facebook pixel can be used to track website events or conversions and can help create remarketing audiences for the Facebook Ads platform. When you click on the icon, it will tell you if one or more Facebook pixels were found. An alternative option to check on the status of your Facebook pixel is through Facebook Business Manager. 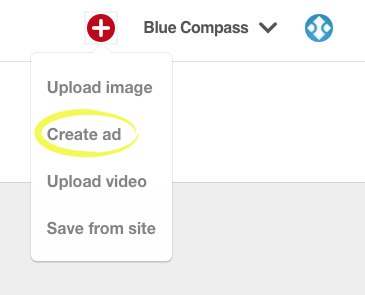 Navigate to your Business Manager account and select “pixels” under the Measure & Report tab. What is the difference between Facebook Business Manager, Ads Manager and Power Editor? These Facebook tools allow you to see your pages, ad accounts and performance metrics all in one place. A Facebook Business Manager account is great if you manage many Facebook pages, similar to an advertising agency. It’s also useful for large corporations that have separate Facebook pages for each branch, location or unit within their organization. If you’re placing and managing ads for one single account, Ads Manager is sufficient. Power Editor is a more advanced version of Ads Manager with the capability to make bulk changes to multiple campaigns and ad sets. Why is my Facebook or Twitter image not pulling through on my embedded link? Your image might not appear if the Open Graph elements aren’t defined or old elements are being pulled through. If you’re seeing an old image appear, try using Facebook’s development tool called the Sharing Debugger. Simply populate the URL and scrape it once or twice to get your new picture to pull through on Facebook. Twitter has a similar feature called a Card Validator. If your business is ready to communicate with your audience in a new way, give social media marketing a try! If you still have questions as you’re planning your social strategy or think your business needs help socializing and promoting content, our digital marketing experts are happy to answer any questions. Feel free to visit our Facebook, Twitter, LinkedIn, Instagram, Pinterest or YouTube page, or browse through the different social media marketing services we offer to get more ideas from our digital marketing specialists.